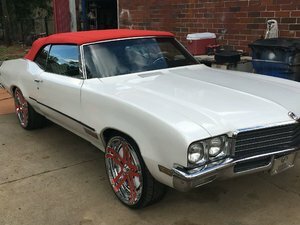 Ready for your next hometown parade is this 1969 Buick Skylark Convertible! This Red convertible is very original 96819 mile car that has had one repaint. Its powered by its 350 V8 engine automatic transmission power steering power top am Delco radio dual exhaust and is riding on a nice set of Rally chrome rims with BFG RWL tires. Its floorsframe and trunk floor all appear to be original and solid. Its exterior red paint was done years ago but still has a real nice straight body and a nice shine. Its black vinyl convertible tops is original and works and keeps water out but should have a new one. Its black bench seat interior is also all original and cleans up real nice. If you are looking for a fun Convertible that you can drive to cruise nights parades and enjoy this may be it! Visit Coyote Classics online at coyoteclassics.com to see more pictures of this vehicle or call us at 641-512-4727 today to schedule your test drive.